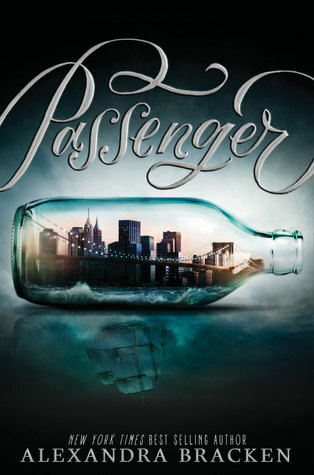 I began reading Passenger with such excitement. I’d heard rave reviews from other bloggers, and this was my first Alexandra Bracken book. I had high expectations but as the pages dragged on, and on, and on, I found myself getting decidedly less excited. I ended up finishing this book feeling let down. This plot was slow. There were things that needed to happen to drive the plot and I could see them lurking in the shadows but the scenes dragged on. The only exciting part of this novel happened to be at the very end. I think I would have been able to slog through a slow plot had the characters been interesting, but I didn’t even like them. The main character Etta is from present day New York and after her mother is captured and she is taken back in time to the 1700’s. Which doesn’t really seem to bother Etta. She adapts quickly and learns the political background of the ruling time travel family. The problem was Etta felt one dimensional she has a very specific goal and doesn’t really deviate. Nicholas is a mixed race son from the ruling traveling family. He is from the 1700’s but doesn’t hold any of the 1700’s ideals. This really bothered me because I just didn’t think it rang true. The romantic relationship in this book was probably what I disliked the most. I wanted to like it. It’s not often authors write a diverse romance but I just thought it all moved too fast. I couldn’t believe the relationship between Etta and Nicholas. I didn’t see the spark and so everything that happened after felt rushed and unnatural. Overall, this novel was just plain boring and when it wasn’t boring the romance was confusing. I still plan on giving The Darkest Minds a try, since I already have the book, but I’m not in a huge hurry to pick it up. And I will definitely be skipping the sequel to this novel. I'm sort of trudging through it right now as well. The cover is AMAZING and the blurb sounded awesome, but it is moving SO SLOWLY. But I do definitely recommend reading the Darkest Minds; it moves a teensy bit slowly in the middle, but it's really great.